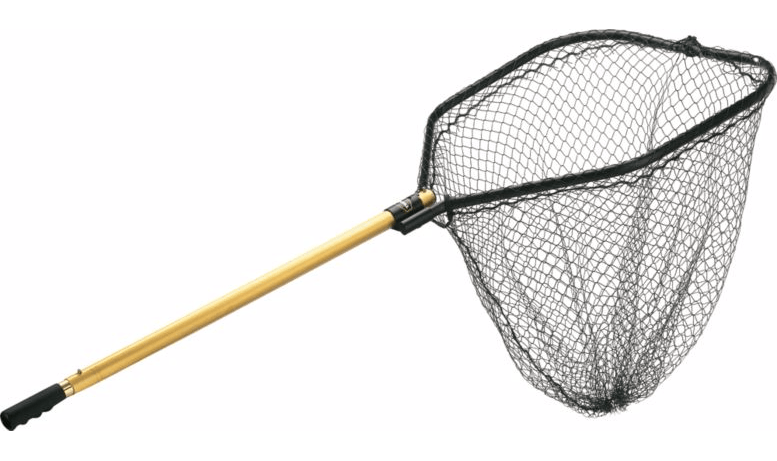 5 Kayak Fishing Nets Reviews – The Best of the Best. Have you ever lost a hard fought fish while landing it from your kayak? Swung a toothy critter into your kayak so it can flop and thrash between your legs? Ever had a fish slap its tail so hard it knocked your favorite pliers overboard? I have. And I started researching the best kayak fishing nets so it never happens again. … then I choose a winner, buy it, test it and see if I made the right choice. 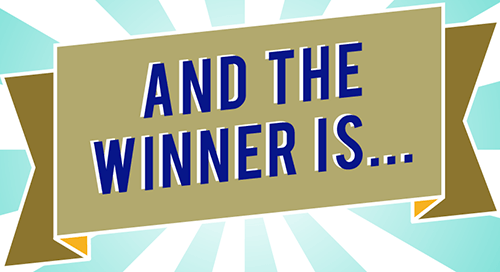 Click here to skip down & read my review of the winner! 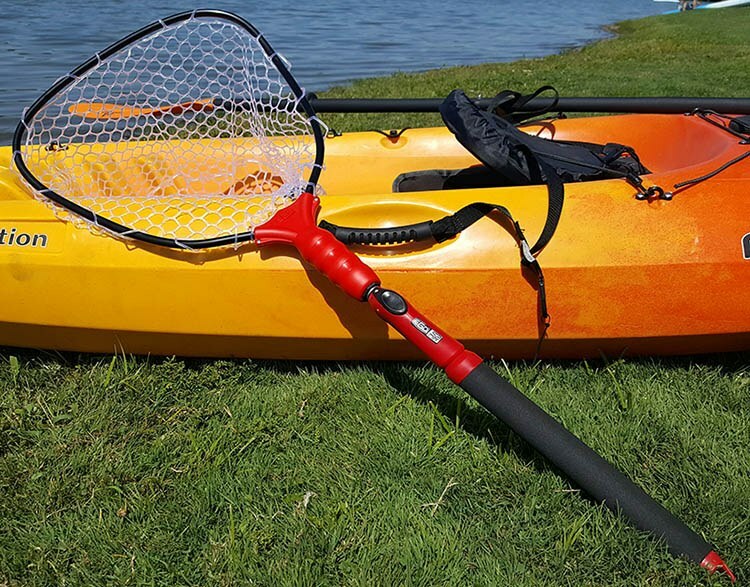 First introduced in 2010 the YakAttack Leverage Landing Net has gained popularity year after year due to the ergonomic leverage handle that fits under your forearm for (you guessed it) MORE LEVERAGE. Making it easier than ever to fight the fish with one hand and land it with the other. Few nets are as functional as the Leverage and not just because of the unique handle, which is the big selling point. The hoop flips back on the handle when stored, cutting the length in half which is nice on a crowded kayak. And with the flip of the wrist the hoop extends out and locks it in place. The knotless, rubber dipped net cuts down on snagged hooks and tangles which is nice. The nylon net is dipped in rubber which is less abrasive than straight nylon. It will protect the fish and increase the survival rate but the netting is thin and wide, which is light, but is not as fish friendly as heavier rubber which is not available. Weighing in at 3 pounds, the leverage is not what I would consider a light net, but the unique handle makes it feel much lighter than it actually is. It does not float so it may be worth attaching some buoyant to it in case you drop it. The Leverage, with foam handle extension, sells for ~$84.99, a great price for such a high quality piece of equipment with so many unique features. It gets a high ranking in this category. The netting can get caught on the net release mechanism requiring you to use two hands to open it. My advice would be open the net before you leave shore and put it in a rod holder behind you. The net also has a limited reach which can be a drawback if you have a feisty fish on, or lots of stuff on your line that won’t fit through the guides. The Leverage Landing Net scored a total of 16.75 out of 20 total points. If you are looking for a unique design, and some real lifting power this is the net to buy. 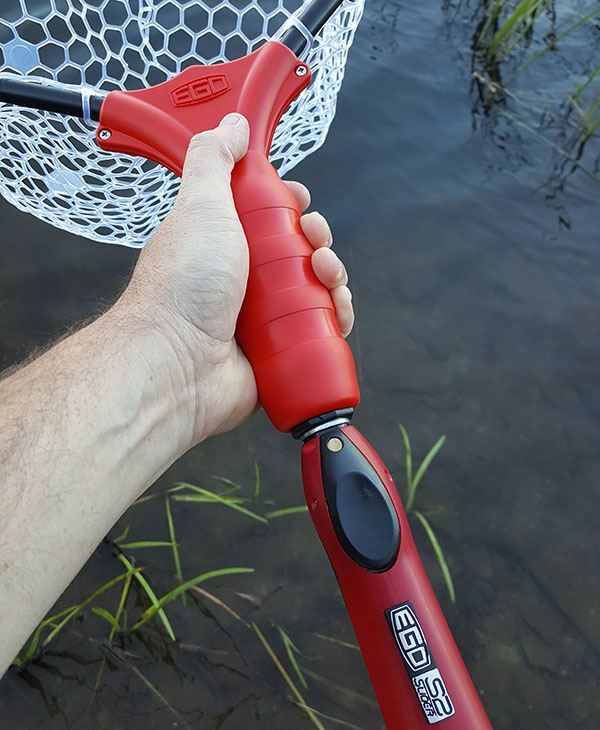 No one has matched the innovative handle and the foam extension fits in a rod holder which gets the net out of the way. These nets are very popular and sell out quick, Amazon seems to always have them available. You can check the latest prices by clicking here. EGO continues to improve their versatile line of landing nets with mind-blowing new options that were made for the kayak fisherman. Beefed up for 2016, the S2 Slider can handle fish up to 30 pounds when fully extended and looks flat out cool. It comes in several lengths from 18 to 108 inches to fit your type of fishing and has a unique set of screw on/screw off accessories (sold separately) like a gaff, hook retriever, boat hook and deck brush. The S2 really crushes it in this category. Let’s start with the hoop which has a unique scooped shape for netting fish. The heavy duty, rubber grip gives you a great grip and leverage to lift big fish, sometimes with one hand. The push button extendable shaft is padded, comfortable and gives you instant reach which comes in handy when you can’t reel in too far because of weights or leaders that won’t go through your guides. You can choose from 3 different netting options, PVC coated mesh (which also floats), the zip on/off PVC coated mesh with measuring tape (shown) and the rubber mesh bag. The rubber bag ranks the highest in fish friendliness, but the soft PVC mesh is a close second. Overall the line ranks pretty high in this category. The weight varies by size and netting type, they are all made of lightweight aluminum and most of the models float depending on the netting option. The prices range from $64.99 for the straight PVC coated mesh bag, up to $109.99 for the guide version shown above. Pretty reasonable for everything this net can do. Previous versions of the S2 lacked strength when fully extended. This was a big complaint that the company addressed very quickly and the early reviews are positive. The EGO S2 Slider scored a total of 17.5 out of 20 total points ranking it well above the competitors. From the push button extension, to the selection of netting, to the lightweight and beefed up construction the S2 Slider has it all and has proven itself as the best kayak fishing net. Amazon carries the complete line with all sizes and netting options, you can check the latest prices by clicking here. Fishpond Nomad Mid Length Boat Net is made of carbon fiber and fiberglass composite making it incredibly light and incredibly strong. It’s finished with a rubberized paint for a better grip and a clear rubber net. It’s a beautiful net made to last a lifetime. It’s definitely the highest tech net in the line up as far as materials are concerned. 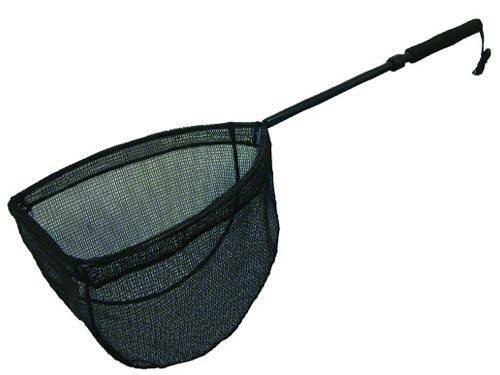 It’s super light for a net with a full rubber bag and the fact that it floats is a huge plus. The netting attaches to the hoop just like the net on a basketball rim making it easy to change it if you wear yours out. The handle will fit in some rod holders and the rubber net keeps hang-ups to a minimum. Otherwise there aren’t a lot of bells and whistles on the Nomad, it’s just super light and super strong. All of the Nomad nets come with the clear rubber bag netting which is the most fish friendly material there is. 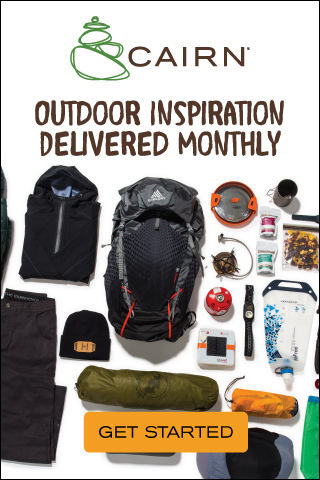 Fishpond is a fly fishing brand which is predominantly a catch and release crowd so it makes sense. 1.23 pounds. That’s all this net weighs. I’m not sure there’s anything else to say but, “Wow!” And yes it floats like a cork. At $219.95, the Nomad Mid Length Boat is the most expensive net on the list. Is it worth it? Probably. It’s made to last a lifetime which I can’t say about some of the other nets on this list. 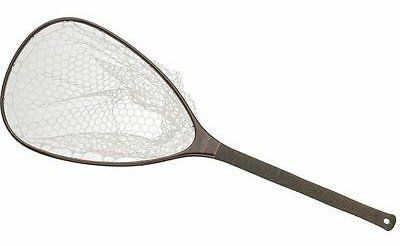 The price takes this net out of reach for some and the fixed length is a drawback for a kayak fisherman that may need some extra distance. The Fishpond Nomad scored a total of 16 out of 20 total points. 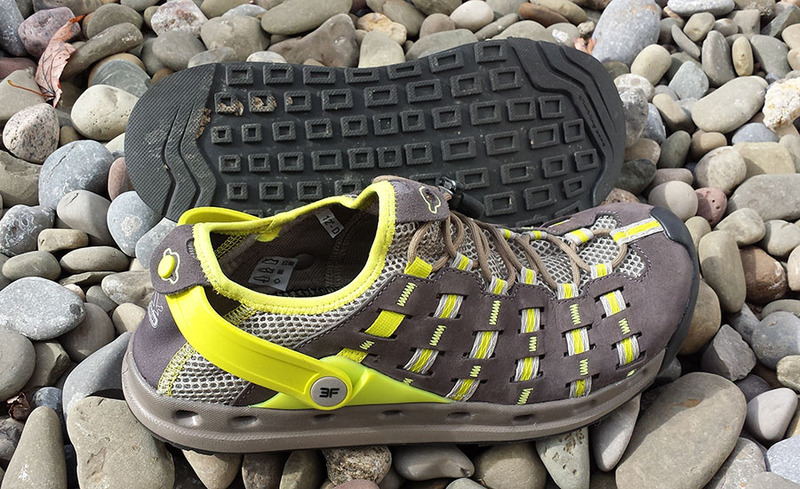 The Fishpond Nomad came up short on price and functionality. 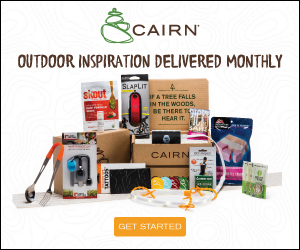 Being a fly fisherman, I would love to own one some day, but as a kayak fisherman, I think there are more versatile options on the list. If you would like to learn more or check the latest prices click here. Frabill is one of the most trusted brands in fishing and they make a huge assortment of nets for all kinds of fishing. Their newest line is the Power Stow line of nets. 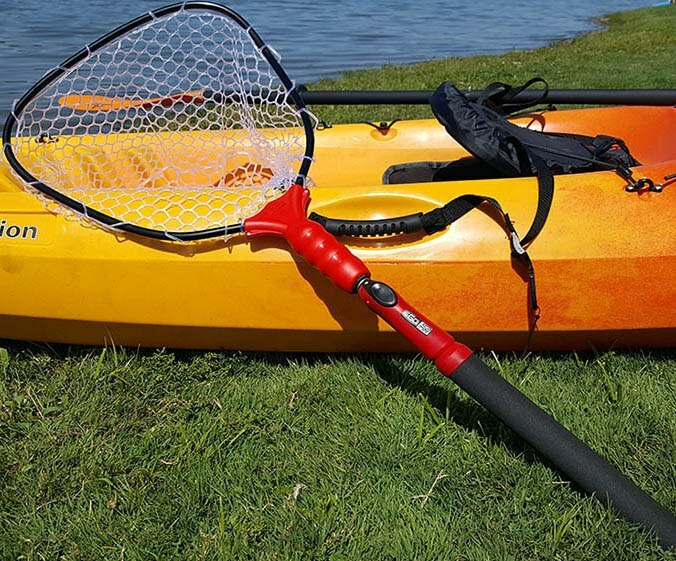 With a telescoping aluminum shaft, a glass filled nylon yoke for serious strength and a micro fins mesh netting. 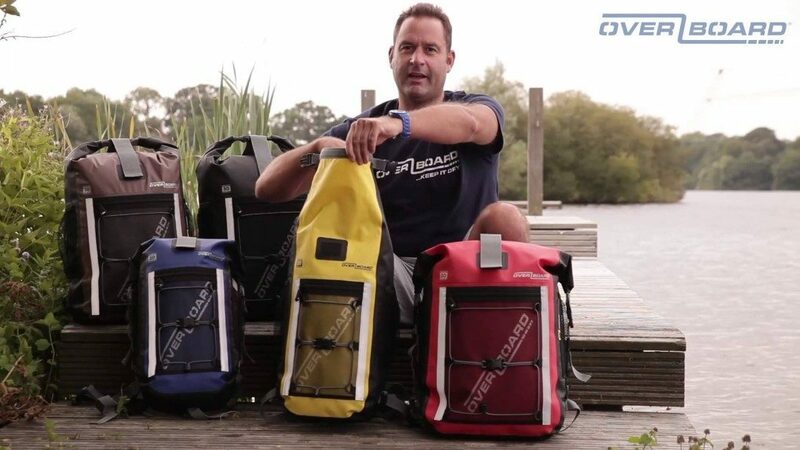 It comes in several sizes to fit your fishing. The model shown here is the Walleye. Compact storage. Shaft slides up through the net and the hoop folds in half over it. 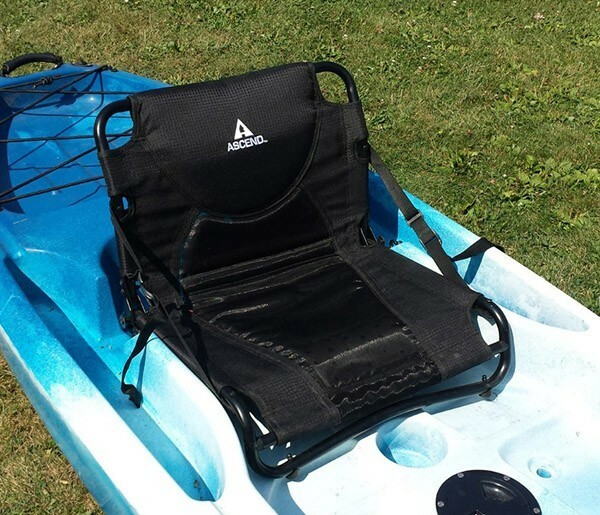 Great for kayaks with limited storage space. The net can easily be deployed with two hands, or even one hand and a foot if you wait until you have a fish on to extend it. The netting on the Power Stow is 3/8 of an inch, small but not small enough. Even though it’s a double dipped nylon it still isn’t high on the fish friendliness scale. It’s also a deeper net than the others in the group which tends to be tougher to remove the fish. Made of all lightweight components, like quality aluminum and lightweight mesh, the Power Stow nets are quite light, but they do not float. At $112.99 (for The Walleye), I feel that this isn’t a great value relative to some of the other nets and what they offer, so the Frabill didn’t get a high score from me here. The netting is not as durable or snag resistant as I would like. Treble hooks tangle easily and if you’re netting big fish all day the double coated does wear out and holes start appearing, no one wants that. The Frabill Power Stow scores 13.75 out of 20, they put a great folding design together with a decent telescoping shaft but unfortunately skimped on a good bag which doesn’t hold up well and is rough on the fish. It also seems a bit overpriced in my opinion. Unfortunately, the Power Stow scored at the bottom of the list. Promar has a huge line of inshore and offshore nets that offer good value. 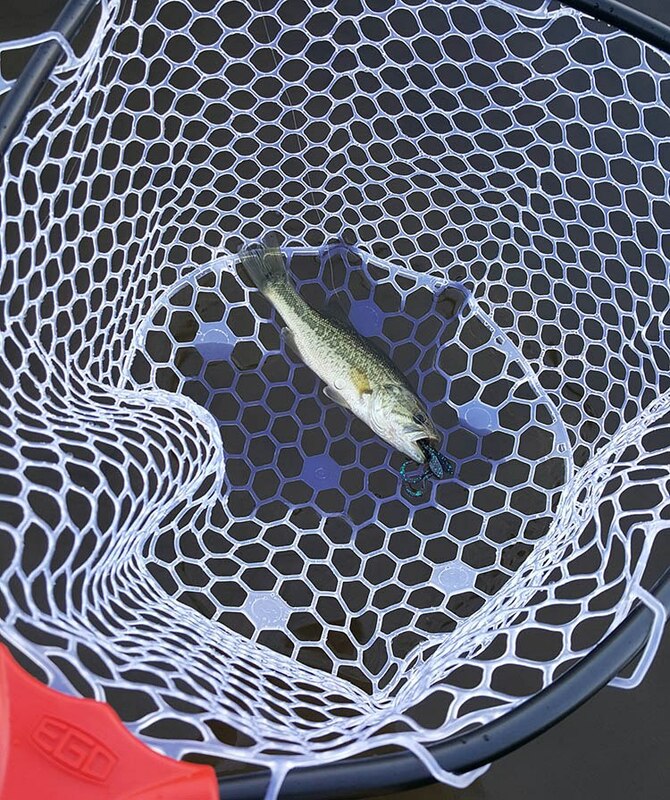 The ProMesh is one of their newer nets with what they claim is a zero snag netting. The LN-651 has a 20×21 inch net that’s 14 inches deep, large enough to handle good sized bass. The ProMesh is a capable net made with anodized aluminum, a really high quality bag and a simple telescoping mechanism. The net separates from the shaft with two pins for easy storage. Pretty good score in this category. The 3/16″ fine mesh is definitely easy on the fish and the bag is the right depth and shape to net and release which really helps with mortality. Tough to find a listed weight on this net but with lightweight aluminum and a mesh bag it doesn’t weigh much. Having said that I would be surprised if it floats for long. At $44.99 it’s a good value, you can find it at prices below that at some of the sporting good outlet stores. I’ve seen it as low as $29.99. Some of the screws and other hardware have been known to rust so it’s purely a freshwater net. The telescoping mechanism has a plastic nut that twist locks. It could be heavier duty, as it has been known to strip or not lock tight enough to keep the net from spinning. The Promar ProMesh scored a total of 15 out of 20 total points landing it squarely in the bottom half of the group. It’s a solid net that will perform in a lot of different situations but it came up short on features. As I mentioned before you can find some pretty good deals on this one if you look around. With the highest score, it was an easy choice to try the S2 Slider. The beefy construction, simple handle extension, rubber netting, good flotation, and reasonable price all factored in. I purchased the compact version with an 18 inch handle that extends to 36. It fits securely in a rod holder keeping it behind me and out of the way. When the company said they beefed up the construction of the 2016 model for better lifting strength they weren’t joking. When I took it out of the box I actually thought they may have overdone it. The extra large grip at the base of the net is huge and gives you some serious lifting leverage. It’s also the balance point and quite comfortable to carry. The ability to extend the net is a huge benefit. I normally use lightweight tackle so I can’t horse even medium sized fish. With rod in one hand and an extended net that’s light enough to manage with the other I am hopeful I will lose very few fish boat side. Pulling back on the handle… which extends the shaft back and forward to 36 inches. To retract, press the button and push the handle which brings the handle back to the original length of 18 inches. The mechanism works well and allows you to extend it a little or a lot and still feel like you have a solid handle. If you look closely you can make out a bass in this net! I chose the clear rubber, mesh bag which is the most fish friendly and almost impossible to snag your hooks. Of course on my testing day this was the largest fish I caught so I wasn’t able to test the weight capacity of the net. The net is lightweight and well balanced, the rubber mesh bag is a little heavier than the other options and isn’t guaranteed to float. In my test it did… for a little while… and then slowly sank below the surface. This was the only shortfall I found with this net. It will stay on the surface for a while but I wouldn’t leave it for long. I paid $79.99 for the EGO S2 Slider Compact with clear rubber mesh bag and 17 x 19 inch hoop. After using the net and comparing the price of the other nets on the list I feel good about what I got for my money for all the reasons I mentioned above. Did I Pick the Right Net? Absolutely. I couldn’t be happier with it. If you need a kayak specific net I would recommend it. The S2 Slider is well made and well designed. If you’ve been looking for that extra hand on the kayak this is it. You can learn more and check the latest prices on Amazon here. I’ve found they have the best prices for these nets. As always thank you for reading and supporting us. We really appreciate it. NextREI Camp Folding Cot Review. Great Sleep, Great Price. 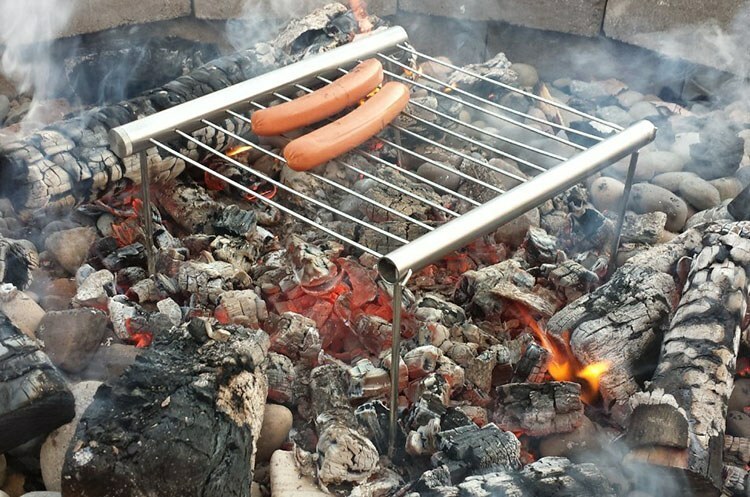 The Grilliput Duo Review – An Ultra Compact Grill. Get Your Food Off The Rocks!